1. This is a privately owned unit and guests are renting directly from the homeowners whose company name is VACATION REALTY HAWAII (as will appear on your credit card statement). Therefore your reservation is non-transferable between other properties. a. This condominium is professionally managed by Vacation Realty Hawaii LLC (808) 822-0272. 2. Resort Fees: HANALEI BAY RESORT WILL CHARGE YOU $20 PER DAY FOR RESORT USAGE. THIS INCLUDES POOL TOWELS,AMENITIES AND WIFI. THERE ALSO IS A $6 PER DAY PARKING FEE PER CAR. THE GUEST IS RESPONSIBLE FOR PAYING THESE CHARGES WHICH ARE DUE AT CHECKOUT. Resorts that require “resort fees” for guests staying on the property solely make the decision on what the amount of the fees will be and it is out of the control of the owner of this property. These fees are subject to change at anytime without notice and could change before your arrival and could be different than the original fee stated in your reservation. We make every effort to communicate changes in fees as soon as we are notified. 3. Amenities provided by third-party vendors (for example utility companies or subcontractors) are beyond our control. We do our best to provide services such as cable television, internet, and resort telephones. Should these be unavailable for part or all of your stay we will do our best to help restore services, but ultimately cannot be held responsible. Should you absolutely require internet access we recommend you make arrangement for these services through a cell phone company. 5. The reservation deposit is nonrefundable; however if a cancellation is made more than 60 days prior to the check-in date, the full reservation deposit may be applied to a new set of reservation dates in the same condo beginning anytime up to one year from the original check-in date (subject to availability). Cancellations made within 30 days of the check-in date results in loss of all payments. 1. The regular occupancy for 7307 is 6. Guests are obligated to disclose the actual number of occupants prior to arrival. 2. We do our very best to have the units clean and in proper working order for your arrival. Should there be any cleaning or maintenance problems please call your on-island contact at your first opportunity. We require the opportunity to rectify any problems and will do so in a reasonable amount of time. 3. At no time should anyone sleep on sofas other than sleeper sofas that are opened up and have sheets on them. 4. A pack-n-play and booster seat are available at no extra charge, but must be requested via email to alohacondos@vacationrealtyhawaii.com at the time of booking or with reasonable notice prior to arrival. If more than one is needed, it then will be up to the guest to rent one from a local rental company. 5. Stays of more than 10 days have additional mandatory interim-cleaning. For example if you stay for 11 nights you would have an interim and a final outclean. If you stay for 21 nights you would have two interim cleans and one outclean. 6. Check-in time is 3 PM and checkout time is 10 AM. Please be certain to plan your arrival and departure times accordingly. We have a very tight cleaning schedule and the housekeeper will likely arrive at 10:00 to begin the clean. Extra charges may apply if you have not departed at 10:00 as we have to compensate the housekeeper for wait-time. If you need an early check-in or late check-out we recommend you book an extra night. 7. Cleaning fees are based on an average hourly cost. If the condo is left excessively messy and it can’t be made rent-ready within the cost of the cleaning fee, guests will be charged $37.50/hr for the additional cleaning. 8. Suntan lotions, after-sun lotions and related products leave bleach-like stains in fabrics. Please be careful with our upholstery and bedspreads. We use white towels and white sheets for this reason, but it is not practical to have white sofas and bedspreads. Please shower before getting into bed, and please sit on a towel if you have sun products on your skin and you want to sit on the upholstery. Wash hands thoroughly after applying sun products to avoid accidentally damaging fabrics. Guests are responsible for damage to linens and upholstery from products they use. 9. Smoking is strictly prohibited in the condo or on the condo lanai and doing so will result in full loss of security deposit. We have covered lanais, so the smoke gets trapped and blows into the unit. 10. Air conditioning is available. Please know that Kauai has the most expensive electricity on the island and condo electric bills run between $450 and $700 a month. Please help us to conserve electricity and keep our rates down by turning off the a/c when you are not home, keeping blinds closed during the day to keep the condo cool, and keeping windows and sliding doors closed when you are running the a/c. 11. We provide sheets for each bed and two bath towels per stated guest. There is no daily housekeeping service, however you are welcome to use the washer/dryers in the units. If you have an interim clean included with your reservation we will launder the linens during the clean. Please do not leave personal laundry in the washer when housekeeping is coming for the interim clean. 12. We also provide a reasonable amount of amenities such as toilet paper, paper towels, tissue, soaps and detergents for your use. Should you run out, you are responsible for purchasing additional products for the duration of your stay, unless you have an interim clean at which time we will replenish those supplies. 13. Please make sure that all towels, beach equipment and remotes are left behind at the condo when you depart. Turn keys in to the front desk. We charge replacement costs for each lost item (cost of item, travel time & accounting). Generally items are lost because they are left in the rental car, so please check your car carefully before you leave for the airport. 14. No pets of any kind are allowed except for service animals. 15. Keep indoor furniture indoors, and outdoor furniture outdoors. There is a $50 fee if furniture needs to be moved back to its original place upon your departure. For example, if you move a large glass table, the management company will have to hire someone to go help the housekeeper put it back. 16. Hurricane or Storm Policy: No refund will be given unless a “mandatory evacuation order” has been given by the National Weather Service for Princeville and the surrounding area. In the event a mandatory evacuation order is issued we will refund unused portions of rent of a guest currently occupying the property and any advanced rents or deposits collected for a guest that is scheduled to arrive during the Hurricane Warning period. 17. GUESTS ARE RESPONSILBLE FOR FOLLOWING THE HOUSE RULES OF HANALEI BAY RESORT. Violation of the rules can result in fines, and guests are responsible for paying those fines. In severe cases if guests are permanently removed from the condo and from the grounds of HBR by the homeowner, property manager, resort management company or the police the guest will not be refunded for rent paid for unused nights, even if the guest is prohibited from returning to the property. 3. Condominium living requires each resident to have respect for the needs and rights of others. The main purpose of these rules is to provide for the enjoyment, comfort and safety of each owner and guest, to protect all the occupants at the resort from annoyance and nuisance caused by improper use of the common elements at HBR and to protect the value and desirability of HBR. § Owners are responsible for the conduct of their tenants & guests. Owners unable to control the conduct of their tenants & guests shall, upon request of the board or managing agent, remove such persons from HBR. § Guest registration at the front desk upon arrival at HBR is mandatory for all occupants. Parking permits and pool towels will only be provided to registered occupants. All occupants must check-out with the front desk upon departure. § No pets of any kind are permitted at HBR, with the exception of service animals for persons with disabilities. § Feeding or caring for stray animals or wild birds anywhere at HBR is prohibited. § Outdoor grilling or cooking is only permitted on the grills owned by the association in designated areas (by the round pool). § Grilling or cooking on lanais is strictly prohibited. Because our lanais are covered an open flame creates a fire hazard and risks smoke damage to the interior of the unit. An open flame on the lanai is a serious offense as it is dangerous and violates our insurance policies. Likewise, purchasing any kind of cooking device such as a hot plate for the interior of the unit is also strictly prohibited. § All garbage, rubbish and trash must be properly bagged and placed at designated areas in the resort. HBR is not responsible for the disposal of appliances, furniture or other large items from owner units. § The illegal presence, possession or use of non-prescription drugs or other controlled substances is not permitted anywhere at HBR. § All owners and guests shall avoid excessive or disturbing noise of any kind at all times. Quiet hours are in effect including but not limited to, lanais from 10:00 PM to 7:00 AM. All radios, televisions, stereos, musical instruments or other music must be played at a reduced volume inside the condos during these quiet hours so as not to disturb other occupants. Construction hours are 9:00 AM to 5:00 PM Monday – Friday. Excessive or disturbing noise of any kind at any time should be reported to the General Manager. § Lanai areas shall be kept in a neat, attractive and sanitary condition. No objects are to be hung on the railings. At no time should any debris or water be swept from upper level lanais onto lower level units. § The board has adopted Hawaii’s “Smoke Free Law” for all of HBR. § Smoking is prohibited in all areas on the grounds and in and around the buildings including: all open areas such as lawn areas, tennis courts, the hot tub area and the swimming pool areas and all enclosed areas or partially enclosed areas including but not limited to all lanais. § The only exception to this rule will be any areas designated as smoking areas which will be identified by appropriate signage. § Violation of this rule shall be subject to the enforcement provisions of HBR and may also result in the imposition of any applicable penalty provisions set forth in Hawaii’s “Smoke Free Law”. § No vehicle shall be parked or left unattended except in designated parking stalls. Vehicles parked in handicapped parking stalls must display a current handicap placard. § Damage to vehicles and other objects shall be the responsibility of the person causing the damage and the owner. § Violators of any of the above parking regulations shall have their vehicles towed away or immobilized at their own expense. § Bicycles, skateboards, scooters, mopeds, rollerblades or other wheeled objects are not to be ridden on the walkways. Walk your bikes to the unit. § Anyone found tampering with fire equipment or ventilation systems will be subject to criminal charges and/or be liable for repairs, replacement or damages caused to the building or personal property. § Every owner, tenant, and guest hereby grants a right of entry to any persons authorized by the General Manager in the event of an emergency originating in or threatening a Unit, whether or not the occupant is present at the time. § No flammable or hazardous materials such as gasoline, kerosene or explosive materials or articles deemed hazardous to life, limb or property or the presence of which may increase HBR’s hazard or liability insurance premiums shall be stored in Owner storage closets or in Units. § Hours are from 8:00 AM to 10:00 PM. § Trespassers shall be fined up to $200 and removed from the premises. § There are no lifeguards on duty. § Use of pools and hot tub is at your own risk. § A responsible adult must accompany children under 12 when using the pools or hot tub. § Appropriate swimwear is required. Swim diapers required for children not yet potty trained. § Children under 5 are not permitted in the hot tub at any time. § Swimming aids will be allowed in swim areas with adult supervision and should not interfere with other people’s use of the pool. § No climbing is allowed on the rocks in the pool or hot tub area. § There shall be no running, diving, pushing or spitting in or around pool or hot tub or grounds around the pool. § Game playing should not interfere with others use of the pools, create a safely hazard or create noise in the pool area. § The general manager has the right to determine if pool conduct is objectionable. § Use of the swimming pools and hot tub is limited to occupants of the units at HBR. A limited number of guest passes may be issued at the front desk. § No smoking in or around pools or hot tub area. § Towels are available at the pool activity center or from the front desk and must be returned before additional towels may be received and no later than at check-out. Unreturned towels are subject to a charge upon check-out. § Second offense: a second offense is a $150.00 fine and request that they immediately curtail such offense. § Third offense: onward incremental increases of fines of up to $1000.00 at the discretion of the General Manager, with a review by the Board of Directors, will be given for each repeated offense until such action is curtailed. I would highly recommend this condo and Hanalei Bay Resort in general. The view was fanatastic. The condo was great. I felt the price was certainly fair for what we experienced. Maybe this is just me, but I really liked all the birds as well. My understanding is that they are doing renovations around the complex. None of that affected our stay. If someone asked me where to stay on the north side of Kauai this would be the place. Our family has stayed at a lot of rentals over the years, and this was our favorite! The view was just AMAZING, the kitchen was extremely well supplied and clean, the beds were wonderfully comfortable, and the resort was lovely. We very much appreciated the beach supplies (boogie boards, snorkels, sand toys, etc) and our kids absolutely loved the resort pools and hot tub. Having the washer and dryer was a huge plus also. We hope to be back again very soon!! This condo is part of a wonderful resort. The grounds are gorgeous and concierge is very helpful.The condo it self is beautiful and has all that you need. It’s exactly as the pictures show and the kitchen is fully stocked. We also enjoyed all the water toys. The shared BBQs were always available and clean. This condo felt like home! We absolutely LOVED Condo 7307 at Hanalei Bay Resort! When we first arrived, we checke din with the front desk and they called a man to help us bring our suitcases to our room via a golf cart. Tipping is expected. That was the one and only time we used the golf cart service though. The walk to 7307 is not that far from the parking lot, though it is down a hill. The views from 7307 are OUT OF THIS WORLD and I am so very thankful we chose to stay on the north shore, especially at HBR. This particular condo looks out over the bali hai mountains and has a gorgeous sunset view. The balcony also overlooks the small pool at the resort which is also where the grills/cooking area is. We grilled out there one night and our kids swam in the smaller pool. There is even a kitchen sink under the community grilling area. If you want to go to the larger pool, it's just a short walk away too. Multiple tennis courts here at this resort, though we never used them. At sunset, many of the people staying here will bring their chairs out to the grassy area near the larger pool and watch the sunset together. So lovely! The inside of this condo is gorgeous. Everything has been updated and is beautiful. It was so nice to have our own washer and dryer and dishwasher and of course air conditioning! Our kids slept in the loft area and the a/c worked perfectly up there. They loved each having a "big" bed to sleep in. The only minor change I would suggest to the owners is to consider a new type of faucet in the bathroom. The water pressure is very low so it comes out like a trickle and it doesn't extend far enough into the sink and as a result, water gets all over the counter. The beach nearest to HBR is called Puu Poa and it's very calm and sandy. It's shared with the St. Regis hotel. The walk to get to this beach is very steep so you should wear comfortable shoes to get there and back (or I think there may also be a golf cart service the resort provides to get to/from the beach, though we never used that). We also walked from this condo to Hideaway Beach (our absolute favorite beach we visited on the island). It took about 20-30 minutes to walk there but the parking is so limited at Hideaway and we really wanted to go, so we kept our beach items we had to carry to a minimum and I'm so glad we went. So picturesque here but it's an intensely steep hike down to the beach and I wouldn't recommend unless you have on proper footwear and have no medical issues/small children. Totally worth a visit though!! Princeville is a really lovely area- very "yuppie." There is a golf course here and running trails. Just beautiful driving around the grounds near HBR. We loved driving into Hanalei Town for dinner (Hanalei Bay Pizza and Federico's were our favs). We also liked wandering around the Princeville Shopping Center and got ice cream here and shopped at the grocery store. This is just a few minutes drive from the condo. Overall, we HIGHLY recommend Hanalei Bay Resort and especially this particular condo. What an absolutely gorgeous place to stay! Thank you so much to the owners for sharing their place with us! Thank you for the wonderful review you gave for the unit 7307 at the Hanalei Bay Resort. It is a great and upgraded condo with incredible views. The Hanalei Bay Resort as you mentioned is in a great location and has fabulous amenties. We are so happy you enjoyed your stay and hope you will return. We will look into the faucet at the bathroom sink. We so appreciate you comments! The condo was good, but the owner was bad. The pool next to my building was closed for my entire 9 day stay. The owner refused to give me any type of compensation. Thank you for mentioning the great condo at 7307 at the Hanalei Bay Resort. It recently has been totally remodeled and beautifully decorated and of course the views from the lanai are second to none with the majestic mountains, the aqua blue ocean, the iconic Bali Hai and the famous Hanalei Bay that capture the true essence of this island paradise. We do apologize for the lack of the small pool use because of the renovation and it was a surprise to us as well. However the resort and all its great amenities, we hope you did enjoy, from the large lagoon style pool with waterfalls and an abundance of lounging chairs and palapas , the hot tub with cascading waterfalls, the swim up pool bar, the sandy bottom wading pool area, the direct beach access, the mutltiple tennis courts, the BBQ areas for great outdoor meal preparation, the firepit area for viewing the spectacular sunsets, the fitness center and the guest lounge as well as the lushly landscaped grounds, abounding in tropical foliage and flowers including orchids perched in the trees throughout. We also hope you took advantage as we mentioned to you, the bell boys and the option for them to chauffeur you on the property in golf carts when desired without charge. We also hope you did take the time to stop in at the on site lounge/restaurant and set the mood with the island style music entertainment to add to your fun tropical getaway. This well-furnished and modern condo has jaw dropping views of Hanalei Bay. It’s a very well-equipped condo for a family with 3 children. There were clean linens and sheets, fantastic kitchen supplies and water-sports equipments etc. It felt like home. Will definitely stay in this unit again the next time we go to Kauai. Thanks Aloha Condos for the impeccable response and made our wonderful vacation a dream come through. My husband and I stayed in Condo 7307 in early December 2017 and absolutely loved it. The view from the master bedroom and the living room is incredible. What a fantastic way to wake up! The furnishings were new and comfortable. We loved the grounds, the pool with the swim up bar, and the short path down to the beach. The front desk staff when we checked in were incredibly pleasant, professional, and helpful getting us set up to lounge by the pool since we arrived a little bit early before the condo was ready. We highly recommend this particular condo. Thanks for the great review! We are so happy you enjoyed the condo, the views and the resort. This is a great unit with a complete remodel having been done one year ago, it is in great shape and is beautifully and tastefully decorated with new furnishings. The location and the amenities of the resort are also wonderful and we are glad you enjoyed and hope you can come again! Let me start by telling you the type of travelers that we are. We have had plenty of stays in 5 star luxury properties so we have been spoiled a bit. BUT we don't always want to spend that type of money, especially not with two teenage boys, so we often use Marriotts or Hiltons. Before this stay we spent a week at the Marriott Waiohai resport in Poipu. Just telling you this for point of reference. This condo at the Hanalei Bay Resort was super clean, great size, and had every amenity, utensil, and beach supply you could possibly need. Felt like we were home! My husband is the cook in the family and he was surprised by all the kitchen amenities. Loft was great for kids (only one bathroom though for 4 people). Bathroom and shower were new and clean. Renovation of the condo was beautiful! View from balcony was dreamy. Ate all our dinners outside. The resort pool is amazing and the beach is lovely! There is a short drive to the beach (via resort golf cart) but its actually a neat little ride through the jungle! Thank you to Mandy for getting us in a little early (not promised, just so happened to work out). Property management (Kristen) was great, prompt responses and helpful. So for picky (but not snobby) vacationers, we had a great time! We will absolutely come back to this unit. Thank you so much for the great review. This is a great condo and has been completely remodeled. Thanks for noting the property was clean and had all you needed and more. The steps are worth the incredible view you get to enjoy every day! Thanks for posting. We do appreciate it! This condo was absolutely gorgeous! We fell in love the moment we walked in the door! The entire house is updated and very comfortable, even the beds and pillows! Waking up to the view of the ocean and listening to the waves crash made us never want to leave! In the closet we found so many essentials that we were grateful to use- sand toys, beach chairs, tennis rackets and balls, rolling cooler, kids life vests, flippers and snorkel mask, and boogie boards! The open kitchen had essentials too, such as oil, seasonings, a little coffee...etc. It was also supplied with laundry detergent! The owners left a gift bag filled with many goodies that were put to great use! The AC was not working in the loft but the part had already been ordered. It would have been nice to know ahead of time, but our son didn't seem to mind having just the fan on him. Our friends were in another condo that was no where near as spectacular as ours. We were glad to have spent the extra $50/night on this place. The resort is very spread out and beautiful! Make sure to get help with your luggage since the condo is on the 3rd floor! It's quite the walk to/from the parking lot and pool up and down hills! I brought my running gear but never needed a run with all the walking we did! The beach is down a long long hill, but the view is worth it! We will definitely visit this resort again and hope to be able to rent this same condo! Thank you so much for the great review. The owner has recently totally remodeled this unit and it is pretty amazing! The unit is fully stocked and has all that you will need for a great vacation stay. It was unfortunate that the AC did break but it is like any other property, those things happen and we are waiting on a part which can be a challange living on an island. However it should be in soon. The good news was that the other AC was working in the bedroom though. The views are just incredible and the resort has lots of nice amenities. The direct beach access is unusual for the Princeville area so that is a bonus. The resort does sit on a bluff so it is a downhill paved pathway that leads down to the beach and of course uphill on the way back. However you do have the option to have the bell boys in the golf coruse take you to and from the beach. There is a phone at the bottom of the pathway to call them when needed. We are glad to hear you hope to come back again to this condo and stay. I cannot say enough good things about this condo. First walk in the door and it is Wow for the amazing views. We spent much time sitting on the big balcony with its great outdoor furniture. The bedding was comfortable and the condo was clean. It is the best equipped rental I have ever stayed in with everything included from beach chairs and tennis racquets to salt/pepper and all kitchen utensils, washing powder, garbage bags. I cannot say enough good things. The Resort is amazing and Hanalei Bay is awesome. We will definitely be back. I have to tell you the front desk staff at Hanalei Bay resort were very rude and not helpful,everytime we had an issue I would call them on my cell phone as no phone in the room they would say since we rented a unit from a private owner they could not help us. One time they did send a nice gentleman to our unit to help figure out the cd player. The woman who checked us in was very cold and rude I wish I coukld remember her name as she was not nice. I would not suggested this resort to others because of the front desk staff. The rersort itself and surrounds were nice. We so appreciate your review and letting us know your experiences. The front desk and staff is a separate entity from us as they represent the resort/time share portion of the resort and we represent private owners of individual condos. When you placed the reservation with us, we did give you mutliple emails informing you that if any issues came up to contact us. Our number is in those emails, in our policies that are disclosed as well as posted in the unit itself. We are available 24/7 and are there to help you with any issues or concerns. We wish you would have contacted us so we could have helped you. We will follow with the the resort manager in charge of the front desk and let him know our concerns. Thank you for noting you were pleased with the resort itself. It is a beautiful resort which has had many renovations to the amenities and grounds in the last couple of years and the location is perfect and of course the views are amazing especially from this condo! Lovely Resort but the condo ???? We enjoyed our stay at Hanalei Bay Resort. The staff was wonderful and the grounds beautiful. Our unit was in dire need of updating !!! The furniture, carpet, paint job etc. very drab and rather depressing. We had friends staying in another unit at the complex and their unit was much nicer ( same price) because it was clean and decorated. Recommend telling the owners they really need to bite the bullet and put some money into their rental property!! Thank you for posting a review as we do appreciate hearing from our guests. Although the owner, since they purchased this unit have made lots nice additions with the basics of bedding, towels, kitchenware and some assessories, they do have plans later this year to renovate and make lots of updates. The property is actually blocked out after Sept to accommodate this renovation. However in this unit, the incredible view will make this vacation something very special and create memories for a life time. The third floor location takes in the amazing surrounding mountains, the ocean and the famous Hanalei Bay! Sunset are breathtaking! As you did mention, the grounds are beauiful at the Hanalei Bay Resort and it is a very special place. We hope you will come back again! UPDATE! This condos at the end of 2016 was completely renovated from top to bottom from furnishings to finishes, flooring, paint, trim, interior doors, complete kitchen and bathroom remodels. A brand new loft has also been added for extra space! You won't be disappointed with the results. Just Amazing! My husband and I stayed here for our honeymoon & fell in love with the North Shore. This area was our hands down favorite during our 2-week stay in Hawaii (Waikiki, Kauai North Shore and Oahu North Shore). The 7307 unit was spacious and comfortable, and had spectacular views of Hanalei Bay and the Makana Mountains. The golf cart access to/front the parking lot (esp. when checking in and out with our luggage) was great. We loved making our own meals with delicious food/veggies/fruits from the local Waipa Farmer's Market and other markets. The only possible drawback, as prior reviewers have said, is that the unit is a bit outdated, but this didn't bother us. The staff at Aloha Condos, especially Christine (who we were in touch with during our stay), were helpful and friendly. We would definitely stay in the HBR again and work with Aloha Condos, should we return to Kauai. Mahalo and Aloha! We really love to hear from our guests and how their stay went at the Hanalei Bay Resort unit 7307. The North shore is a special place and holds the beauty like no other place! Thank you for noting the condo is spacious and comfortable. The owners bought this condo in recent years and have put in some new items in and new carpeting but do have lots of plans to remodel. Thank you for the mention of the staff helpfulness as we do strive to make our guests feel welcome and accommodated. We are so glad to hear you would come back and stay with us again. UPDATE on REMODEL! The owners have taken this condo and completely renovated it with the completion in Dec of 2016. It has been completely transformed from top to bottom with new furnishings, a brand new loft added, new paint, trim, flooring, interior doors, completely new kitchen and bathroom! It is like a brand new unit! Just Beautiful! Thank you for your review and making note of the great service and communication. We really do try hard to please our guests, keep them informed and want their stay to be a very positive experience. The owners of this unit does have some plans most likely later this year to do some updates in this unit. Since they purchased the unit, they have made lots of improvement and will continue to do so. Thank you for your business and please do come back again! IMPROVEMENTS COMPLETED! The owner has taken this condo and completely renovated it from top to bottom and also added a loft making this even more spacious! New everything! Floors, trim, paint, bathrooms, kitchen, furniture and more! Beautiful condo and beautiful views!!! The only down-side of this condo is that the living room furnishings are very outdated and quite worn, but we didn't spend much time sitting around the living room.... there was too much else to see and do! The kitchen was great and we loved eating our meals out on the deck. Overall, this was a wonderful place to stay with an unbeatable view. We loved this condo so much, we added 2 extra days. My friend had previously gotten married and stayed in the same condo and suggested it to me. I'm so glad I got it for my dates! It was large, beautiful, comfortable, lovely kitchen, incredible view :)wish I could go back right now. We we're impressed with this unit's amenities. Everything from beach chairs to lotion to paper towels, dish & laundry soap and even condiments were provided. The view of Bali Hai from the lanai is wonderful. This unit has a wonderful unobstructed view of Bali Hai and Hanalei Bay. We loved being on the top floor; we could leave the sliding doors ajar and listen to the surf. (Be advised, though--there are no elevators.) The unit is comfortably furnished and the kitchen has more utensils and cookware than we needed. The bed is good and there are extra pillows and blankets. Having the washer and dryer in the unit is terrific. (There's also a good hairdryer, in case you're wondering.) We used the chaises and the table and chairs on the lanai whenever weather allowed. We reported a couple of problems and made some requests, and all were handled within a very reasonable time by either the resort's maintenance people or the unit's management company. Everyone we encountered at the resort and through the management company was very pleasant and easy to work with. Hanalei Bay Resort is built on some steep hills, and walking around the resort gives one an excellent cardiovascular workout. There are wonderful bellmen who will drive you wherever you need to go on the resort grounds if you wish to make use of their services. They are also willing and quite able to carry luggage and heavy groceries up the stairs, so don't be deterred unless you find stairs a real barrier. We would definitely return to this property. Thank you for taking the time to send us your reviews on your recent stay at the Hanalei Bay Resort, unit 7307. We are pleased to hear that you enjoyed your stay and you would like to return. This unit as you spoke about does have an incredible view and from the third floor, it is spectacular! We diligently do try to make sure our guests have all that they might need and appreciate that you acknowledged the unit was very accommodating with kitchen supplies, washer and dryer and comfortable bedding. This resort is a 22 acre facility and is located on a bluff. Therefore, the grounds do present some walking and elevation changes. The good news as you mentioned, is that the resort does have bellmen that drive golf carts for those who do not wish to take the walk. We look forward to serving you again in your next stay in paradise. My husband and I got married at HBR and stayed in 7307, with friends next door in 7308. Beautiful, beautiful view, spacious room, everything you need for BBQing and cooking in. There's boogie boards and snorkel gear, chairs and coolers in the closet. Washer/dryer in the unit.Loved it so much! Some things could improve...the fridge is showing it's age and the shower pressure is low. But how can I complain about something so small? Beautiful property and my wedding and reception were magical. Can't wait to be back! Unit was somewhat dated but comfortable. The price and location made it great! Would definitely return!!! Our stay at this condo was magnificent! Unit 7307 has spectacular veiws of the bay and mountains, along with beautiful veiws of the lush landscaping below. The condo was nicely appointed and had everything we needed to make our stay comfortable and pleasant. We will definately visit again. Thank you for your kind review of the unit at the Hanalei Bay Resort 7307. This unit does have the most incredible view of all the North shore beauty. We are glad that you found it to have all that you needed and we do hope that you will allow us to accommodate you again in your next stay. Mahalo for your business. Great place, especially for the cost! Lovely views from the balcony (and comfy furniture out there)! Nice pool and hot tub in the complex. Short walk to the beach. Condo comes equipped with snorkel gear, cooler, beach chairs - everything you need! The kitchen is also fully stocked with cooking equipment, which made grilling out a breeze. I would certainly stay here again if ever back in Kauai. Staff is very nice. The only downside is that it's a bit of a (hilly) walk to get to the condo from the parking lot, but they have people driving golf carts to assist if you like (but bring some $1s to tip!). I wouldn't book anything through the concierge - they take a deposit which you don't get back even if the event is cancelled! worn out condo - avoid! We booked for 8 nights and left after the first night - no way were we going to spend our vacation in this condo. Unit 7307 appears never to have been renovated - it is worn, dated and nothing as advertised. One kitchen cabinet door was hanging off one hinge. There were holes in the walls and the bathroom was just grotty - moldy shower curtain, peeling paint and cheap shower head. The kitchen was similarly old, dated and worn.The view of the Bay from the balcony is distant. The condo is located quite a walk from the parking lot and would be awkward for bringing groceries, if you planned to cook. The resort is also looking tired - the "renovations" on the restaurant and front office looked to us as if they had stalled quite some time ago. We have recently taken over management of unit 7307 and are working rapidly with the new homeowners to upgrade and renovate their property. Before your stay we thoroughly cleaned the condo and added brand new fabric shower curtain liners, sheets, pillows and towels. There are many photographs online and we believe it is advertised accurately and that the view from Hanalei Bay Resort is one of the best in the state, particularly from this building. We are available 24/7 as is the front desk and would have been happy to repair the hinge immediately – which we did after your departure. We have since also replaced the living room carpet and the majority of the contents of the kitchen. We were unable to find any holes in the walls or peeling paint. We all look forward to the reopening of the restaurant and front desk which is in progress, however that is beyond our control as private property managers. Kristen, Vacation Realty Hawaii LLC. Awesome views, just as advertised!! We spent two weeks in unit 7307 in October/November 2013, the views were as advertised, unit was very comfortable and in great location in HBR resort, but there were some issues in the bathroom, mold on shower curtain and in grout, it took three days for maintenance to fix a leaky bathroom faucet, however the kitchen is well stocked and beach supplies, rolling ice chest, boogie boards and chairs were great. We would stay in this unit again. We really enjoyed our honeymoon stay in this unit. The view is incredible and being top floor in a somewhat remotely located building on the property allowed for a more private experience than units close to the center of the resort. The furniture is a little dated and the bathroom fixtures could use an upgrade, but the aC units are brand new and run ice cold, vaulted ceilings make the rooms feel huge, and again the view over Hanalei Bay is amazing! For the price, it was a great experience. We especially appreciated that the condo came equipped with beach chairs, coolers, snorkeling gear, and tennis rackets. So you're to have fun without wasting time and money on rental equipment. Do I have to leave????? My daughter and I just returned from Kauai and stayed at the Hanalei Bay Resort, unit 7307. In short, we LOVED it! The view looking out at Hanalei Bay while the sun was setting was magical! The unit was large, a workable sized kitchen with a small eating bar, a table with four chairs and a large living room that was very comfortable. The lanai was big and stretched across the width of the condo. There was a lounging chair, a high table with two seats and another table for four. We had a full view of Bali Hai but our view of Hanalei Bay closer to the shore was limited due to the eaves of the next condo. Any photos you may see of 7307 are representative of the condo and property. The kitchen was fully equipped and the closet was loaded with snorkel, fins, boogie boards, tennis rackets and balls. I gave a "great" rating for bathroom cleanliness although there was a minor issue. I have already emailed Chuck, the manager, and I am sure it will be taken care of for the next renter. The beach was OK, not good for swimming as the reef starts just a few feet out but it is great for snorkeling! There are big trees along the beach for shade making it a wonderful way to spend a lazy afternoon. The worst part of the beach is the monstrosity of the St. Regis which is in full view of the beach. Don't look to your right and you might be able to forget that it's there. The pool is nice, it looks like there is some construction going on around the rock area. I read a review that it is one of the top 10 hotel pools in the US. I don't get it....The hot tub is also nice. There are eight tennis courts. The upper four courts are in pristine condition and in constant use. The lower four courts have cracks and are in need of repair but they are useable. There is also a proshop if you need a racket. The grounds are in beautiful shape, the condos could use some sanding and painting on the steps which are looking pretty worn. I know there is work going on around the facility but don't know what is being done. HBR is set up on a hill and cars can not get to the condos. HBR provides carts and drivers and they will transport you to your condo or the beach if you don't want to walk. A couple of the cart drivers seemed to actively avoid making eye contact so they wouldn't have to pick you up. (hence the "good" rating for overall customer service) Only one cart driver actually stopped and asked if we wanted a ride to our location. The office staff was wonderful and could not have been more helpful. We made our reservation through Chuck who always seemed to be sitting at the computer whenever I emailed as the responses were so quick! We had plans change, then change again, then again. He never indicated impatience. Thank you Chuck, you were fabulous! A couple of things you may miss in the fine print: 1. there is a daily resort fee. This is standard everywhere on the island 2. There is no restaurant or bar on the premises due to a fire a few years ago. Construction is ongoing. 3. There is also work being done on some of the condos. The website offers a construction schedule so you know if you are within earshot of the work. HBR has everything I was expecting and have no hesitation in renting here again or in recommending it to others. The four star rating recognizes the few shortcomings mentioned above. I have no hesitation in recommending HBR or Unit 7307. My wife and I, plus our two adult children and their significant others, enjoyed five wonderful days in the two connected units, 7307 and 7308. It is on the third floor, so the view of Hanalei Bay is just as advertised - stunning! We spent many an hour on the balcony just sipping coffee (or wine), and enjoying the view. All the amenities are there, and everything worked. It is close to all the attractions of the North Shore - kayaking on the river just minutes away, hiking, dining, snorkeling, and my wife particularly took advantage of the Yoga classes at the shopping center just two miles away. The staff could not have been more courteous, and even though we didn't use it, they were always available to give us a ride on their "carts" to the beach, or anything other place on the complex. Truly an enjoyable experience, and would love to come back during the summer months. True Paradise in Unit 7307!! My husband and I stayed in Unit 7307 for 5 nights in the beginning of November. It was everything we could have hoped for and more. Absolutely perfect location with the most stunning views. The condo itself is beautifully furnished and the owner has included so many additional ammenities to make you truly feel at home (cooler, koozies, beach mats, tennis racquets, etc). They have even got a fully stocked movie library with movies filmed on the island, books about the local flowers, trees, etc and a binder with local restaurants. Have I mentioned the view? We sat on the lanai for hours daily and just couldn't get enough. The parking is a short (5 minute) uphill walk and you can call for a shuttle to take you anytime you wish, but we truly enjoyed the walk. It's a little longer hike to the beach but again, the shuttle will take you there and back. Make sure and ask for the bellman to help you get your luggage to and from the unit. That really helps. The resort itself is beautiful. The main pool is very nicely done and we so enjoyed the quiet atmosphere of the resort. Chuck at aloha was wonderfult to email reminders and they made the resort fee and cleaning charge very clear in all the information sent. I looked all over Kauai and nothing even came close in terms of price, location and the stunning views. It was our first trip away from our kids and it was true paradise. We cannot wait to return!! We are so glad that your stay was great, and that you enjoyed all the special touches we try to include to make your stay as perfect as possible. Thanks for renting our condo, and we hope you will be back soon. the room was very nice and big ,however there was four of us and no pullout bed just cushions from the couch and twin sheet sets. So we slept on the floor and did the best we could. If we were eighteen it would have been fine but at fifty we woke up sore,and did not sleep well.Our room for the rest of our stay 3201/3202 was much nicer.Had a great time thought,and will be back. We are sorry we didn't realize and reserve both our units, 7307 and 7308, which have 2 king beds, & 2 baths for your stay. We have the extra twin couch and twin futons available for guests who want to take advantage of a terrific value for an ocean view condo. We hope you will come back and enjoy the more comfortable arrangement, and we apologize for the misunderstanding. We really enjoyed our vacation in Hanalei Bay Resort Condo 7307. The location is great, the view is amazing. The resort is really clean and beautiful. The only complaint we have is that our property 7307 was really dusty. The floor was dirty and the dust was everywhere. I ALWAYS want our guests to have a PERFECT experience in our condo, and the cleaning staff and I will continue to do everything possible to make this so. I am glad the guests contacted the cleaning staff with their concerns, and we will all continue to be super-vigilant in meeting the guests' needs and expectations. We stayed for nine glorious nights, a two night extension from our original plan and had a wonderful time. Every person we encountered at the resort was friendly, helpful and truly possessed the aloha spirit. The golf cart service was a must when checking in and also when returning from the shared St. Regis beach on occasion. The Hanalei Bay and Bali Hai view is incredible. On many evenings we watched outriggers cruise by as the sun set. The resort is a quick drive to the market, the quaint town of Hanalei, the Westin, Queen's Bath (inquire with a local on location) and adjacent to the St. Regis. We thoroughly enjoyed and recommend the spiritual and historical luau at the Mediterranean Gourmet. It was unlike any other that we have attended. The condo itself is well equipped, comfortable and close to the “kiddy pool” / BBQ grills. The resort style pool with the sandy beach and rock bottom Jacuzzi were a welcome treat after daily excursions. Thank you for sharing your Kaua’i home with us. My mom and I stayed in unit 7307-8 (booked through alohacondos.com) during the middle of June 2012 and had the most amazing experience! This condo was absolutely incredible - and it was priced extremely reasonable! The views were to die for - panoramic ocean views! !, the condo was extremely clean and bright, and it was clear that the owners added extra touches to make their guests feel at home. We found extra snorkeling gear, tennis rackets, a book of beach recommendations, a book of restaurant recommendations and menus, and there was even a collection of Dvds filmed on Kauai. This condo has it all and is worth every penny. We will definitely be back! This rental unit made our honeymoon even more special! We can't say enough about how wonderful our stay was in unit 7307. Everything far exceeded our expectations. The condo was huge, with a wonderfully romantic 4-poster bed with netting (exotic! ), a fully stocked kitchen, and the huge, shady lanai had a magnificent view of Hanalei Bay that never got old, plus we were constantly entertained by the birds flying by. We were doubly impressed by the amount of things the unit came stocked with, from the boogie boards, fins, cooler and beach accessories, to the massive book exchange, to the incredible "filmed on Kauai" movie library. Absolutely fantastic value for the money! The resort itself was perfect for us as well; we enjoyed the nearby plunge pool, plus the other, slightly further away "big" pool and the lovely sand-bottom hot tub. We didn't interact very much with the resort personel, but what interactions we did have were memorable for the kindness and friendliness we were invariably shown. We had a great stay in a great place for a great price and not only will we stay there again, we are already trying to figure out how to make it happen as soon as possible. We could not have been happier. An incredible place filled with fun, beauty and relaxation! My family and I rented HBR unit 7307&8, through alohacondos.com and it was the best decision we could have made. The condo overlooks the ocean, mountains and pools on the property. The property has two beautiful pools and six tennis courts, so is great for both a romantic getaway, or family vacation. The condo is very spacious, has a full kitchen, and is very clean. A beautiful beach is just a short 5 minute walk away, golf courses all around and a great running trail right outside the door. With the Princeville marketplace a short drive or nice 2 mile walk away, there is really no need to leave the area. Overall, our stay was amazing! I would go back in a heartbeat and hope to one day! Great place! Great views! Loved it! Would come back again. This place is great! Love the view of the sunset. The unit was comfortable and spacious. Love our stay here. We had such a great time! Thank you! Best trip to Hawaii ever. My family was beyond impressed and pleased with the beauty, comfort, location and friendly staff at the Hanalei Bay Resort. If we had not gone to Kaui for a friend's wedding we probably would not have left the resort at all. It has everything one dreams of when thinking of the Hawaiin Islands.Our condo #7307&8 comfortably slept six adults with full kitchen amenities. It is a very short (beautiful) drive to Hanalei Bay, wonderful beaches and National parks and has very easy access to Lihue airport. If you choose not to get in a car everything you need is available at the resort. I highly recommend a visit to this condo as it is perfect for a young family or for grama and grampa needing to get away. We stayed 5 nights at 7307, which has amazing views of Hanalei Bay, the mountains, and overlooks the small pool at the resort. The lanai is a great shady spot to hang out at any time of the day. The condo is well equiped in the kitchen, and has lots of books to browse and nearly every movie shot on Kauai. There were lots of miscellaneous things there too, like boogie boards and a cooler. The resort is great, the big pool is fun for kids and people were always playing tennis. You can walk to the beach at the St Regis, or Hideaways, or the Queen's Bath. The Foodland market is just a mile away, and it's about 5 minutes drive to Hanalei. Overall, a great place! We love Hanalei Bay Resort; virtually the same views as the St. Regis (aka Princeville Hotel) at a fraction of the price. This unit is now our favorite. We loved the unobstructed views of Hanalei Bay. The unit's kitchen was particularly well equipped--every kitchen utensil you could want. It even had spices and seasonings on hand. Great selection of music, cd's and books,all made it a place of ultimate relaxation. We've always loved the resort grounds and pool area, although the remains from fire in the old restaurant structure detracted a little from the beauty of the pool area. Don't let that keep you away, though. It is a great place at a great price. I had a wonderful week in paradise! The minute I walked through the door of this condo, I was struck by the unbelievable beauty of the view. The living room, my bedroom and my friend's bedroom all faced Hanalei Bay, and each of these rooms had a breathtaking view to enjoy morning coffee, afternoon mai tais and sunsets. The condo was stalked with everything anyone could ever need. It was obvious to me that the owner wanted to make sure that the guests were well cared for. Snorkel gear and boogie board, as well as a fully stocked kitchen made my stay one to remember. The decor was beautifully put together with a tropical air about it. I loved the bamboo floors in the bedrooms and the airy woven carpet in the living room - it kept everything fresh and tropical and light. The condo was very spacious, and more than accommodated the 8 guests we had for dinner one night. I highly recommend this beautiful home to anyone to rent. You may rent it by going to 'alohacondos.com' and look at suites 7307 and 7308, which may be rented separately or together. I'm telling all my friends about it. Thank you!!! My wife and I spent two weeks in HBR #7307. The pictures of the unit and the views from the lanai on the alohacondos.com site do a great job of describing what it is like. A couple of the amenities included with the unit that made our trip that much better were the beach cooler and the snorkeling equipment. The sunsets are dramatic, we've been told the "view will never change" and we didn't tire of enjoying it over breakfast or after a long day at the beach surfing. The unit is a fair walk from the parking lot with quite a hill, but the resort has 24 hour golf cart service to help you with your luggage and getting to and from the unit. Unit 7307 is on the third level and the building it is a part of the stair way only services two rooms on each level so it is very private. Because unit is away from the parking lot you aren't subjected to noise of cars, you do hear the gas powered golf carts though when the windows or doors are open. The bathroom was clean and everything was in working order. The four-poster bed with netting was fun. One of the other reviews mentions the buzzing noise of the air conditioning unit in the master bedroom, it is still there even when the unit isn't running, but it isn't too loud. It was not bothersome to us. One thing I didn't like about it was the floor covering in the living room. It isn't a soft carpet, but I imagine it is quite practical for the climate and how some people may treat a property they are renting. Another thing that sticks out was the refrigerator needs some cleaning on the outside around the sides and top. Overall we *really* enjoyed our time there. The grounds, the unit, the service -everything was very good. Peaceful rest and relaxation in paradise. Our stay at the Hanalei Bay Resort condo was awesome. We were greeted by friendly staff who dropped us off right in front of the condo. The condo made us feel like we were at home but of course in a tropical romantic setting. The condo was so comfortable and tastefully decorated. The grounds of the resort are beautiful and well kept. We had to plan well because there are so many local attractions to do and see. We also spent days relaxing at the resort and on the beach. The bar-b-que area was such a convenience. We met new friends and enjoyed cooking our own meals. We were able to see breeching whales from the shore of the beach. The views from the deck can't be beat - spent many mornings and evenings there taking in the sights, relaxing, and dining. The overall experience was great and can't wait to go back. I stayed in condo 7307 at Hanalei Bay Resort in Princeville, Kauai. We booked through alohacondos.com. The condo is beautifully maintained and is very light, comfortable and user friendly with an unbelievable view. The lanai is the perfect place to sit and have dinner at sunset. There is easy beach access and the resort offers lots of tennis courts, several pools, a fantastic hot tub and outdoor barbeque areas. The condo provided everything else we needed for a great vacation--snorkeling gear, beach chairs, boogie boards, beach towels, sun umbrellas, tennis rackets, coolers...the works! There is a fully equipped kitchen and a washer and dryer, and the owners even provide a collection of movies that have been filmed on Kauai. The interior of the condo feels Hawaiian--open, welcoming and casual. The check-in was quick and efficient. The condo was even better than I expectected - very spacious, comfortable and the view of Hanalei Bay was spectacular. The resort facilities were excellent. We could not have been happier with this condo. Not only was it beautiful and affordable, but it was spacious (more than enough room for the two of us!) and had the most amazing views of the mountains and the ocean. We couldn't believe our view every morning when we woke up. The bedroom and living room were very nice (everything looks exactly like it does in the pictures). I liked that the toilet/shower were separate from the bathroom sink and counter. When my boyfriend was showering, I would be using the sink to get ready and vice versa. There were tiny little bugs (apparently called sunset bugs) that liked to roam around the kitchen counter and they were a bit annoying, but they were so small that it wasn't too much of a problem. Just don't leave food out and pack everything away in cupboards or the fridge. Overall, it was a great experience and we definitely miss this place and will be staying here again upon our next visit! My wife and I loved our stay in condo 7307 and would definitely request this unit again if we returned. The condo was quiet, clean, comfortably furnished, and the views from both lanais were as good as, or better than, those in the online photos. The mid-September sunsets were spectacular when viewed from the lanai, as the sun went down just behind the edge of Bali Hai mountain, and we tried to make sure we were back at the condo in time to watch this daily event. The bed was comfortable, and the kitchen had all the equipment and utensils we needed, though we didn't really cook much during our stay. We appreciated the well-stocked closet with beach gear (boogie boards, chairs, rolling box to carry beach gear, towels, etc. My only complaint with the unit is that we tried to watch a DVD in the living room but couldn't figure out how to make the sound play from the stereo speakers. The sound from TV speakers was poor, so we had to move to the bedroom TV to watch a movie. Also, the bedroom TV did not seem to receive a cable TV signal. We had to use the living room TV for this. Since we really didn't spend much time watching TV, this wasn't a big deal. We didn't try to contact anyone to inquire about this, but it might have helped if the condo provided a short instruction sheet for using the audio/video equipment. I also wasn't interested in paying $10+ per day to have computer access - seems a bit absurd in these times that free internet isn't provided for all units. We rented this condo based on the view and location, and we were more than pleased with our accomodations!! We just married on September 12th, and wanted the perfect place...and found it here!! Highly recommended!! The best thing about this condo was the fantastic view which is why we rented it. The resort grounds are spectacular with the exception of the pool directly below us which is old and not up to par. The condo was clean and well-kept, but also needs to be upgraded to today's standards. It looks like it was built in the seventies, and hasn't been remodeled since. I know the restaurant burned down, but the resort needs to add some sort of food service. We ennded up walking down the path to the St. Regis for evening cocktails, which was nice, but very dark on the return after sunset. Overall, we enjoyed our 2 night stay at the HBR 7307 unit. The reservation process was simple and Chuck, the property management person, responded promptly each time we emailed him with questions. The unit has a wonderful view of the Hanalei Bay from both the living room and bedroom lanai. It is well equipped with beach equipments such as boogie boards, snorkling gears, beach mats, etc. They also have a couple tennis racquets. The kitchen is well equipped as well. Plenty of glasswares and dishes. The unit itself is a bit outdated. The carpet looks dirty. The unit has a dank odor, but what was most troublesome was the ac unit in the living room made a constant buzzing noise. It bothered us when we were reading during the night. The resort offers golf cart pick-up/drop off to the beach and anywhere on site. There are plenty of tennis courts to use. The HBR is nestled within a wonderful community. It is a convenient stay for those who plans to be in the north shore of Kauai. We are glad you enjoyed your stay in our condo, but regret the problems you found. We truly pride ourselves on making your stay as perfect as possible, and only wish you had phoned any of the contacts we provide for any guest questions or concerns. Phone #'s for our maid and maintenance staff are provided, or Chuck or the hotel front desk people could have alerted us to the problems. My only guess is the carpet looked stained possibly due to prior guests with not enough turnaround time to get a carpet cleaner in there. The problem has since been resolved. The buzzing noise of the A/C meant it hadn't been turned off. My suspicion is that the odor was from the unit being closed up, as we have never had a guest mention this. Again, we regret these problems, and only wish we'd had the chance to immediately correct or clear up any situations. We want all guests to be thrilled with their stay. We really strive to provide a spectacular unit with everything a guest could think of provided, from movies filmed in Kauai, boogie boards, flat screens, plentiful & comfortable indoor and outdoor furniture, to fun, cheerful Hawaiian decor. We think the guest receives an amazing value for the best view in the world, in a spacious, lovely condo. While I had visited the Hanalei Resort as a "passing through" spot many times before, I had never stayed there. It was a pleasant surprise to find this piece of paradise. The unit has a spectacular view, is very comfortably furnished, has a great balcony for taking in the breathtaking view and has every amenity and necessity you would ever need. It is an incredible place! Beautiful unit with excellent view of Hanalei bay. We enjoyed our short (3 nights) stay before heading to Poipu; fully equiped kitchen and laudry in the unit are a big plus. Overall, this is an excellent unit with a decent price. This is the third time we've been to Hanalei Bay Resort and we were not disappointed. The grounds have been beautifully kept and the condo was all we could have asked for. We had everything we could have wanted. The kitchen was completely equipped and living room spacious with a wonderful view of Hanalei Bay. The four poster bed was extremely comfortable and the view from the bedroom as good as the living room. We enjoyed sitting out on the balcony mornings and evenings. A great place to stay. My wife and I are blessed to have now enjoyed six vacations at the Hanalei Bay Resort. The well-maintained tropical grounds combined with the view of Hanalei Bay and "Bali Hai" bring us back again and again. This was, however, our first stay in Unit 7307. We wanted that particular building and we very much wanted a third floor accomodation. 7307 met and easily exceded our expectations. The unit was furnished with everything that we possibly could have needed to make the most of our seven night stay. The double wide lanai was wonderful. The presence of both a patio table and chairs as well as a high top table and chairs gave us most appreciated options. When you book this unit, there's no need to go anywhere else on the north shore (although we most certainly did). We enjoyed our stay at HBR. The condo and furnishing where more than adequate. The kids really liked the pool. The walk to the beach was very enjoyable. We wished that the restaurant and bar were open. I guess the downturn with the economy has affected the business. We understand. The view from the balcony is absolutely terrific, but the condo itself is just a place to stay. Building and furnishings are dated, carpets stained, small plain pool was under repair, wild chickens will wake you at 4:00 a.m., and you are at the mercy of fairly unreliable shuttle service to get around(no cars are allowed in the resort area). The locale is nice, though, right on the Bay overlooking Bali Hai, and the beach area, shared with the Princeville Resort, is quite nice. It's a servicable facility -- clean and all appliances (including AC) worked well. Since we were out touring most of the time, it was fine for our purposes. The carpets are clean, and we have done extensive updating since your stay. With our beautiful view, we know a guest will have have a wonderful experience in our beautiful condo. Next time, if there are any problems or concerns, feel free to contact our on-island managers, and we will correct the situation promptly. Aloha Condos is well situated to explore the North side of Kawai (the best side), nice big living areas, well appointed. Who knew November in Hanalei Bay would be so wonderful! We had an absolutely fabulous stay at the resort and our condo #7307 was as perfect as we had hoped, for a good off-season price. Beautiful views every morning, well kept, secluded and yet close to everything the resort had to offer. All the amenities one could need... and we will absolutely be back. Perhaps with the little one! Thank you Hanalei Bay Resort! Friendly staff, convenient location for the north side of the island. Hiking, ziplining, scuba diving were all close by. The condo itself was roomy and comfortable. The beach was not the best in the area, but better beaches are close by. Only downside to our visit were the 4 cockroaches we saw in the kitchen. We made sure we kept all our food in the fridge. Thank you for your review and I am glad that you enjoyed your visit at my lovely condo at Hanalei Bay Resort. Thank you as well for pointing out the extra little guests that decided to visit you in the kitchen during your stay. It's always a good idea to leave your foodstuffs in the fridge while in Hawaii but if a previous guest party had left out any food, that would explain why they came back looking for more. We've contacted our cleaning services and maintenance and they've taken care of the problem and will continue to monitor to make sure the little guests don't come to visit our future guests. My wife and I stayed here for a few days during our honeymoon on Kauai, visiting from Manhattan. It was very clean and comfortable. The Resort is a great, more 'classic kauai' small nook in princeville. 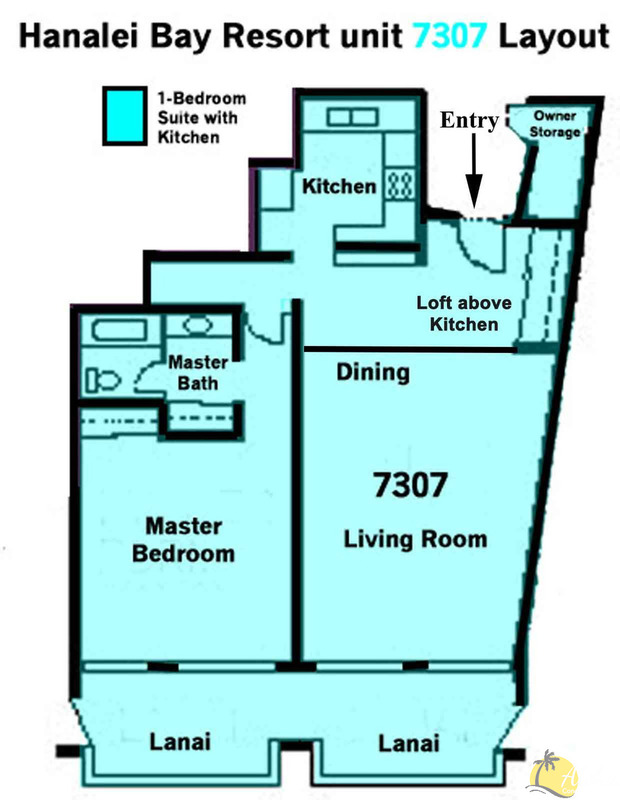 707 was nicely furnished, a very comfy bed, and a lanai you won't forget anytime soon. The restaurant that is situated here and in many guidebooks was not yet open. But that would have added a lot. The people that worked here were very nice and accommodating. You definitely feel like you are on a resort instead of just a condo. Keep in mind although the pier at Hanalei Bay is right around the corner on the beach, if you try and walk there you will probably cut your feet on coral trying. (yes i did). It's very rocky beach below the hotel and it's really best for snorkeling or sun tanning. Once the St. Regis opens later this year, and the main HBR restaurant opens then you would really be set here. Recommended. We thoroughly enjoyed our stay at HB resort in a condo with a terrific bali hai view and all the amenities- plus extra beach equipment-mats,towels,boards,& cooler provided. The resort has great spa, wonderful pools and a path to Hanalei bay and beach.The weather was perfect and sunsets on the lanai gorgeous. hello, we stayed at hanaiel bay resort in condo 7307, it was absoutelybeautiful everything was perfect beautiful, clean and had everything we needed. the pool was beautiful we enjoyed our day at the pool. it was greatthey had a nice guy that made us lunch out on the deck. the condo was beautiful, clean and spacious. we loved it and would definitely go back.we can't wait to visit again. Beautiful view and clean, spacious condos. My wife and I were very happy with everything and will be back again with our kids next time. Great Condo - Wonderful View! The amenities and the view this condo had were fantastic. Looking out at Bali Hai both during the day and at sunset were simply gorgeous. Also, it's location within the Hanalei Bay Resort had it in a beautiful setting. I would recommend this property to anyone! This is a very spacious and well-maintained unit. Our favorite feature was the balcony with the specatular views of Hanalei Bay and the mountains. The owner has a fun collection of movies filmed in Kauai. One of the most picturesque places I have ever stayed. The view from the living room is phenomenal. You can walk to the sand. The cool town of Hanalei is a 5 minute drive. The pool is beautiful. And you wake up every morning staring at puff the magic dragon. My wife and I honeymooned here and this condo was a big part of the wonderful memories we have of Kauai. Very clean, great amenities, comfortable bed. Avoid the time share talk if you can, however. We loved this condo so much in 2006 that we are booking it again this September. It had all the comforts of home and a spectacular view. The only problem with this condo is that we couldn't stay there longer. The view was spectacula. The balcony was awesome, especially to enjoy it from the bedroom and/or the livingroom. The ammenities were graciously provided. The master bedroom was beautiful. The livingroom was spacious and relaxing. We had a wonderful time.